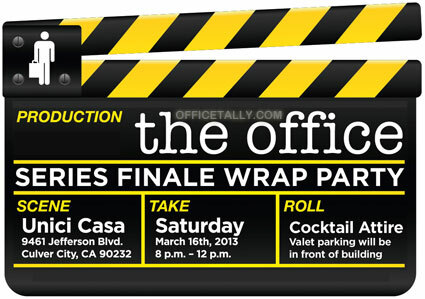 The Office series finale wrap party was held on Saturday, March 16, 2103. Since The Office cast was still shooting the finale when the party started at 8pm, they didn’t arrive to the party until around 10:30 or 11, I think. I believe every guest star that has ever appeared in an episode was invited, but because there were so many people there, I didn’t get to see them all. The Office Executive Producer Greg Daniels gave a really touching speech, which was followed by a video reel, including new bloopers. The Office Wrap Party invitation. The party was eventually extended to 1am.